[Goodbye 2017 in 1980s Style] -- It's the final Flashback post for 2017! In so many ways, this year has been a dumpster fire, particularly on the national and world stages. Sure, like any year, there have been some bright spots. And one of those bright spots is the opportunity to share my love of 80s music. So, how best to say goodbye to this past year in 80s fashion? 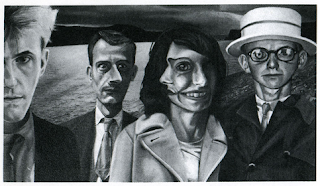 Why, find a trio of songs such that each one, in one way or another, is about endings and changes. If you would like to know what those songs are this time around, you can read and hear more after the jump. [Christmas Blues] -- I love the 80s. I love Christmas music. And I love jazz. So, for this week's Flashback post, I thought I'd share an album that deftly combines all three of those elements. 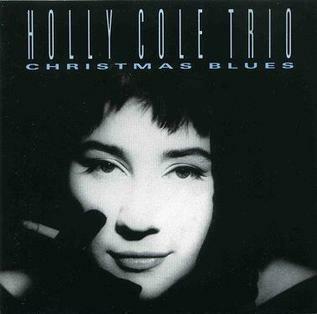 In 1989, Holly Cole released her debut recording, the Christmas Blues EP, with the trio she had formed in 1986. Holy Cole (vocals), Aaron Davis piano), and David Piltch (bass) recorded as a trio until 1995, at which time they simply recorded under Holly's name. But I don't care what they call themselves, they sound great together. Holly's voice and Aaron's piano playing in particular are well-suited for each other. Christmas Blues has only four tracks, one of which is a wonderful, jazzy cover of The Pretenders' "2,000 Miles." Are you familiar with the other three tunes? Well, read and hear more after the jump! [Whither the Smithereens?] -- Perhaps you heard that Pat DiNizio of The Smithereens died this week at the age of 62. His health had been in decline since 2015 after he suffered a pair of falls that damaged the nerves of his right arm. When I saw the band in July 2016, Pat couldn't even hold, let alone play, a guitar. But he still put on a good show with his bandmates, his voice ringing clear with Jim Babjak's Marshall-driven guitar licks. The Smithereens started in 1980 and they specialized in 1960s-ish power pop. That's not surprising considering Pat cited Buddy Holly as his biggest influence. Pat was one of the band's founders. More than that: He was their voice and primary songwriter (hence my theme, "Whither the Smithereens? ", because I don't see where the band can go from here). I can hear the Holly influence, but I wonder how many people missed that due to the Smithereens' much heavier sound. 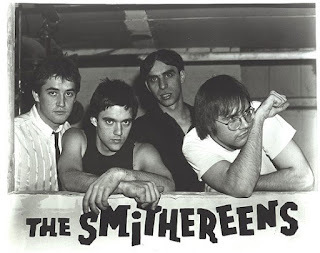 Unlike Holly, however, the Smithereens were criminally underappreciated. At least I feel they were. Anyway, in tribute to the late, great Pat DiNizio, I thought I'd flashback to the Smithereens' 80s catalog. Three of their ten studio LPs were released in the 80s, so I have plenty of fodder. Hmmm. Three albums, three flashback tracks. What will I highlight this weekend? Read and hear more after the jump. [Remembering John Lennon] -- John Lennon was shot and killed on 12/8/1980, 37 years ago today. 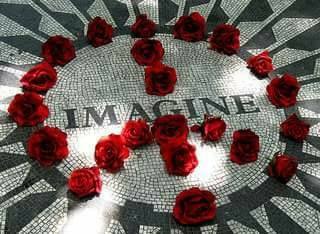 I may not recall exactly what I was doing when I learned of Lennon's death, but I do remember understanding it as a blow not only to music, but also peace activism. He will long be remembered as a peace worker and an anti-war activist. Of course, John Lennon is primarily remembered as a musician, and he has an extensive catalog, dating back to 1962. As my focus is the 1980s, I wanted to commemorate John Lennon with a look at his work released in my favorite decade of music. I say released because he only had a brief window during which he recorded new material in 1980. 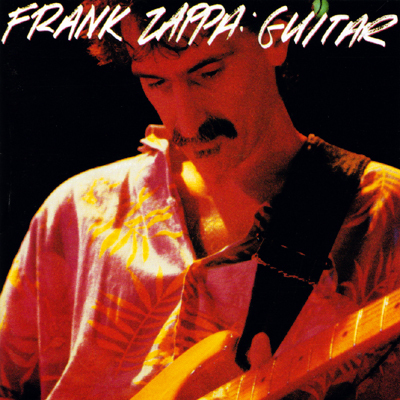 Still, he was prolific, and he left behind enough material for two new records, one studio and one live. So, what have I selected for you this week? Read and hear more after the jump. [Change the Weather] -- When we hit the beginning of December, people in southeast PA usually organize into one faction or the other. The first faction cannot wait for a "Winter Wonderland." 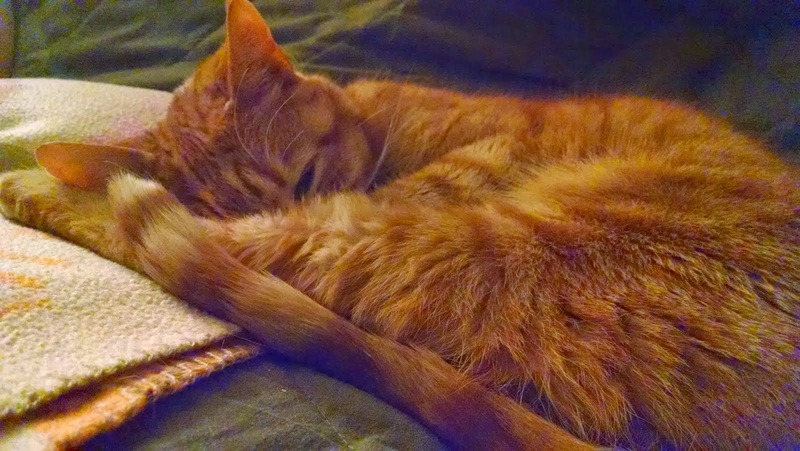 The other one mourns the loss of shorts and flip-flops weather. What I'm saying is that one group welcomes the weather change, while the other wants to change it back. Of course, more recently, the beginning of December has trended somewhat balmy, so that aforementioned second group of flip-flop wearers doesn't have to mourn all that much just yet. All of that is a long and not very interesting intro to this week's album, Change the Weather (1989) by Brit techno rockers, Underground. Change the Weather is Underground's sophomore record, released 12/1/1989, and it is unique in the band's discography in that it did not chart. At all. Perhaps that lack of chart activity is due to a slight change in the band's approach (more 80s pop-rock than the electric techno of, say "Born Slippy .NUXX"). Maybe it was just a dry patch. 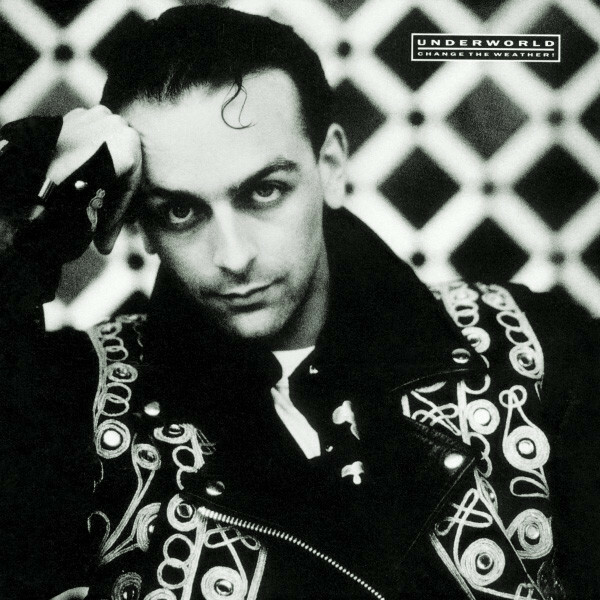 Regardless, Change the Weather is a fine 80s gem that deserves more attention. So, read and hear more about the album's first three tracks after the jump. 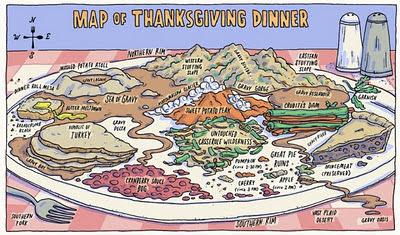 [Food, Family, and More Food] -- Sure, today is Black Friday, but I prefer to dwell on the holiday that just passed. Thanksgiving is a time to gather with loved ones for a communal meal, reflect on ones blessings, share our largesse, and then lapse into a food coma. Now, there aren't too many Thanksgiving-specific tunes from the 80s, so I had to be a little creative for this post and focus on the theme of Food and Family (and, of course, more food). If you have recovered from your food coma and you need a break from the insanity of Black Friday, then check out this week's selections after the break. 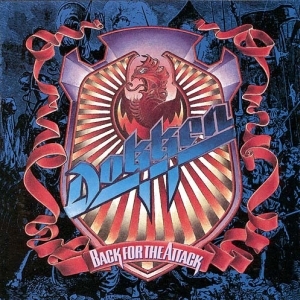 [Back for the Anniversary] -- In the "Things that Make Me Feel Old" Department, November 2017 marks the 30th anniversary of Dokken's fourth studio album, Back for the Attack (1987). 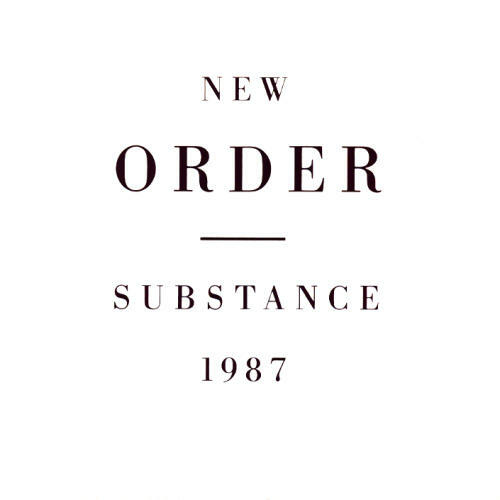 According to at least one source, this album might have been released on November 2, 1987, so it could very well have turned 30 as of this very week. But, not every source marks the month and day, so we won't dwell on such particulars. Although it didn't pack highly catchy tracks like previous releases, Back for the Attack ranks among the band's best-selling albums. It even reached #13 on the Billboard 200 for that year. Maybe that chart success is due to Dokken going for a tighter and harder edged sound. Maybe it's due to the lack of ballads (well, there is one on this record) and a lesser reliance on trying to score pop-radio leaning singles. All I know is that this album has some delicious guitar work and probably the cleanest, albeit simplest, rhythm work of their whole catalog. You can listen to the full album here. If you want to know which tracks I chose to celebrate this 30-year anniversary, you can read and hear more after the jump. 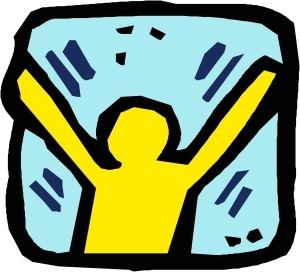 [Goodbye Mom] -- I was more than two thirds of the way through writing my latest Flashback post, but I no longer want to use it. Not this weekend. You see, here's the thing. My sister called me around 5pm yesterday and told me that our mother was gone, that she had unexpectedly died overnight. Sis had gone over to Mom's house to check on her, as per usual, but instead found ... well, she found that Mom never made it out of bed that day. So, my one and only flashback song for this weekend is for the memory of our mother. I'm cribbing both the tune and the write-up from a previous Flashback post, but so be it. It is probably no surprise that I could reliably turn to Disney for a song that honors the very heart of motherhood. Well, I sort of turned to Disney. I turned to Hal Willner, an American music producer with several tribute albums and live events listed among his many credits. In 1988, Willner released his fourth tribute album, Stay Awake: Various Interpretations of Music from Vintage Disney Films. Stay Awake featured new recordings of Disney tunes by a whole range of performing artists, from Sun Ra to Michael Stipe, and from Buster Poindexter to Ringo Starr. 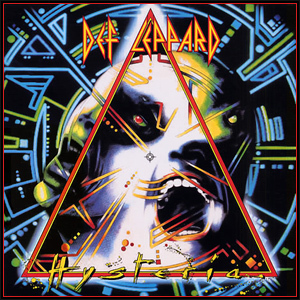 This is still one of my favorite CDs from the 80s. At the time, I loved it because it made a somewhat adult soundtrack out of songs originally created for kids. Almost 30 years later, I still love it for the milestone in my life that it represents. The second track on Stay Awake pairs Bonnie Raitt with Was (Not Was) on "Baby Mine" from the 1941 film Dumbo. And it never fails to make me think of my own mother. "You're so precious to me | Cute as can be | Baby, you're mine." [October Sting] -- I thought about doing a more spooky theme for that rare occasion that the Flashback crosses paths with Friday the 13th, but I wasn't in the mood. 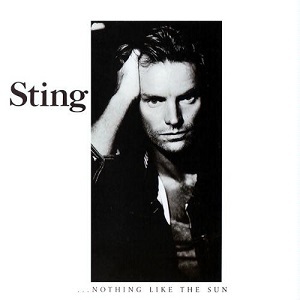 But then I found that Sting's second solo album, ...Nothing Like the Sun, was released on this very day in 1987. That means one of my favorite records turned 30 today! This release finds Sting continuing the pop-jazz explorations of his fantastic debut album, The Dream of the Blue Turtles (1985), but stretching his chops to mix in a little reggae and funk as well as some standard acoustic, rock, and dance elements. All five singles from the album charted, with two peaking as top 40 hits. The album peaked at #9 on the U.S. Billboard 200 and and #52 on U.S. Billboard R&B Albums. And if the songs themselves weren't enough to merit this album's place in my heart, then the story of how Sting named it surely would do the job. The title comes from from Shakespeare's Sonnet No. 130, which Sting had used in response to a wandering drunk who kept accosting him with the question: "How beautiful is the moon?" You can read that brief story in the November/December 1987 edition of Spin. And for this week's selections, you can read and hear more after the jump. [TNG for the Masses] -- On 9/28/1987, the first new television episode of a Star Trek series was beamed into our television sets.Thirty years ago, Star Trek: The Next Generation (ST:TNG or just TNG for short) introduced a new crew and a new ship with "Encounter at Farpoint." It was a clunky and awkward birth, but the basic elements were there: A stalwart captain, a dedicated first officer, and a top notch doctor. Other original series elements took on a slight twist: The alien on the bridge was a Klingon raised by humans, not a Vulcan-Human hybrid; the most logical officer was an android seeking humanity, not a Vulcan-Human hybrid; and the sensing bridge officer was an empathic half-Betazoid, not a telepathic ... well, you get the idea. But, as big a Trek fan as I am, I usually deal with music here for the Friday 80s Flashback. And so I continue in that vein this week. You see, there was an album released on the very same day as the TNG premiere: Depeche Mode's sixth studio album, Music for the Masses. If you know me, you might be surprised to learn that I don't recall if I saw the first broadcast of "Encounter at Farpoint," but I very much recall purchasing a vinyl copy of Music for the Masses. It was the first Depeche Mode record that I purchased fresh on its release date. So, now, you have a choice. 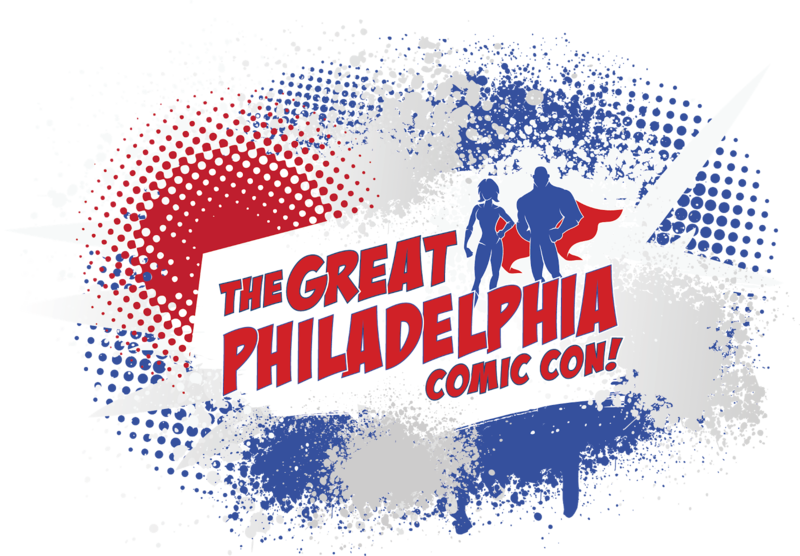 You can celebrate Star Trek: The Next Generation and listen to music from the series. Or, you can check out a few tracks from Music for the Masses. To go with that latter choice, read and hear more after the jump. [Cowboy George] -- The other day, "Do You Really Want to Hurt Me?" by Culture Club was playing in the office cafeteria. It was still wafting through the speakers as I walked up to pay for my lunch. The cashier, who had been singing along with Boy George, told me, "I want to karaoke with him." "Who?" I asked. "Boy George?" "No. Jimmy ... something ... I think." She replied. And that launched a brief exchange in which we finally uncovered that she wanted to do Carpool Karaoke with James Corden. With that sorted, I told her, "All I could think of was that time Culture Club appeared on an episode of The A-Team." Well, it was quickly obvious that neither the cashier nor anyone else in line remembered that particular cameo. The cashier was shocked: "No! 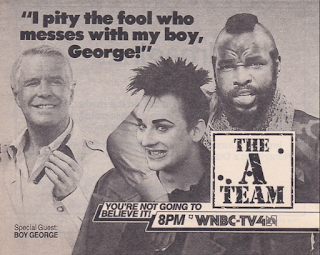 The show with George Peppard? For real?" Yes, for real. This pop culture gem was "Cowboy George" (Season 4, Episode 16) with an air date of February 11, 1986, according to IMDb. Now, I won't go through a recap. If you're interested in that, you can find a great one here. No, I'm going to delve into some music, of course. Can you guess which Culture Club tunes made the cut this week? Well, read and hear more after the jump. 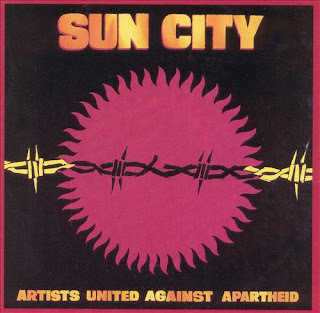 [Sun City] -- December 1985 saw the release of "the most political of all of the charity rock albums of the 1980s" (per AllMusic). I wrote about it on it's 30th anniversary, but given what we're seeing in the news on a regular basis, I think now is a good time to revisit it. It's a damn good reminder of how far we've come ... and how much further we still have to go ... as a society. Sun City didn't achieve great commercial success, but it did peak at #31 on the Billboard 200 pop albums chart. It did, however, receive critical acclaim in abundance, reaching #5 on the Pazz & Jop Critics Poll (yes, that's really the name) for albums for that year. [Flashbackiversary!] -- I started posting the Friday 80s Flashback on September 3, 2010. That's seven years ago as of last week! From 9/3/2010 through 4/29/2016, I made these Flashback posts over at Prophet or Madman. 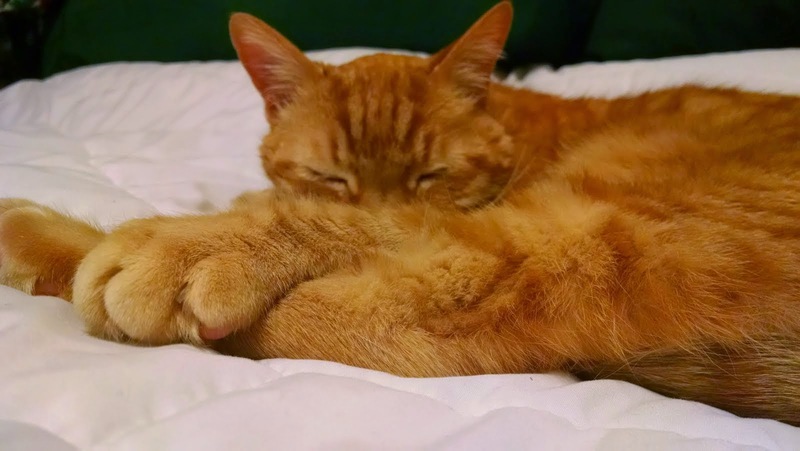 On 6/24/2016, I moved the Flashbacks here to Bookended by Cats. This may be surprising to you, but my very first flashback had no commentary whatsoever. It didn't even have a theme! 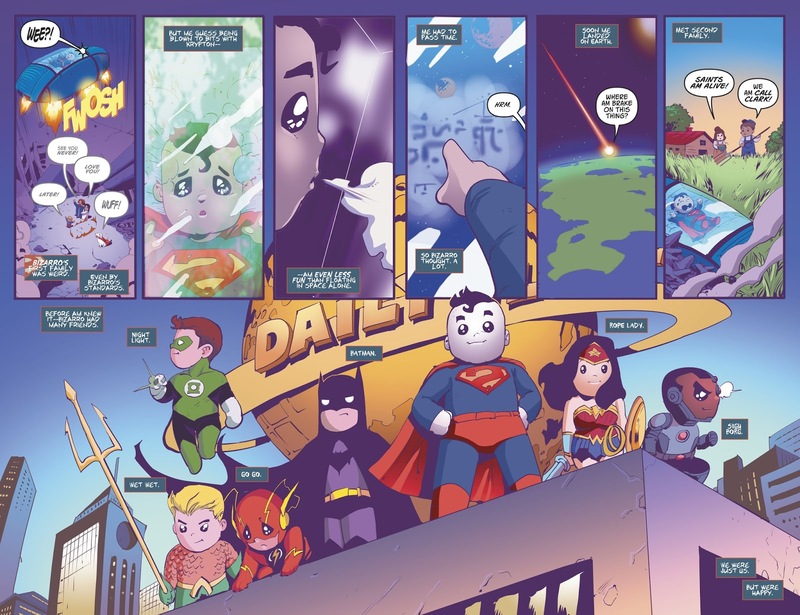 The weekly theme didn't become part and parcel of the flashback until the fourth entry, on September 24, 2010 (a two-fer: Angry Edition and Uplifting Edition). Sample lyrics first appeared in the November 5, 2010, flashback (Politics Schmolotics). 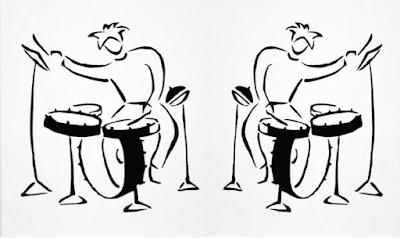 And header images made their debut with the December 10, 2010, flashback (Winter Holidays: Week 2). So, do you remember what songs I featured seven years ago this week? It might be fun to revisit them, so read and hear more after the jump! 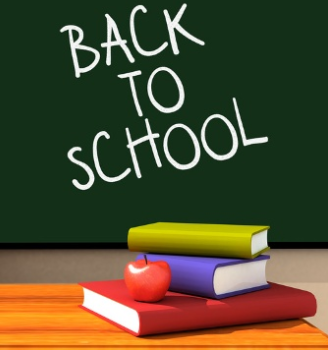 [School Daze] -- Have you noticed a disturbing trend on Facebook over the past week or so? I'm not talking about storms or politics. I'm talking about the fact that parents are posting "1st day of school" photos! Now, I was initially confused because I thought the kids had recently just been let out of school for the Summer. Fortunately, the confusion was lessened slightly because July's back-to-school sales had already taken me well off guard. But, of course, Summer ends with this weekend's Labor Day holiday. People are already dreaming of pumpkin-spice everything, and even champing at the bit for sweater weather. So, how about we observe this not quite subtle schedule shift with some 80s songs about school? If you like that plan, you can read and hear more right after the jump. [Still Not Giving Up] -- On Thursday, 7/27/2017, a momentous anniversary in 80s music occurred. 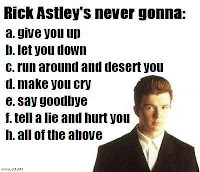 On that date, a certain Mr. Astley hit the charts with a ditty titled, "Never Gonna Give You Up." 30 years later, that song, particularly its accompanying music video, is still popular. 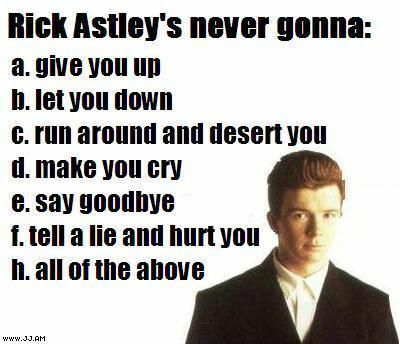 Its popularity, or at least its continued familiarity, is due in large part to a bait and switch practice that first started in 2007 and has come to be known as Rickrolling. Because Rick Astley himself perpetrated the best Rickroll in the practice's 10 year history, I think I'll let his tweet serve as the entirety of this week's Flashback post. That's all till next time. Dedicated 80s-philes can find more flashbacks in the Prophet or Madman archives or via Bookended's 80s Flashback tag. 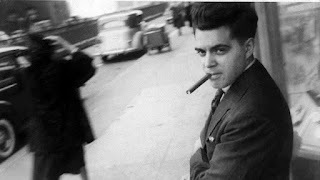 As always, your comments are welcome on today's, or any other, flashback post. And if you like what I'm doing here, please share the link with your friends. If, however, you don't like the flashback, feel free to share it with your enemies. 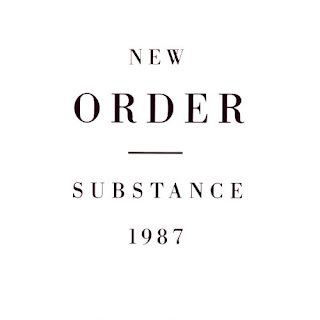 [Come Up Screaming] -- One of my favorite albums was released in 1983, specifically on July 15 of that year. It was an energetic album by a Scottish band. An album pulsing with guitar licks that mimicked bagpipes. 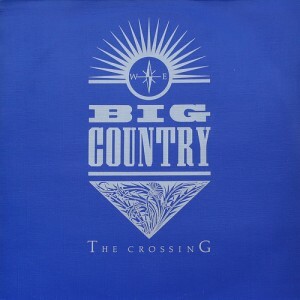 I am, of course, talking about The Crossing by Big Country. 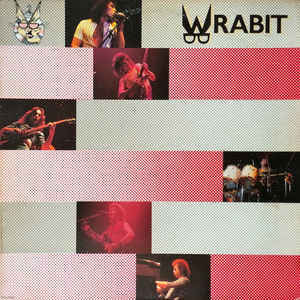 It was the band's first studio release, and it reached #3 in the UK and #18 on the US Billboard 200. I'm pretty sure that the bagpipe trick had something to do with the album's popularity. I mean, it was a pretty neat effect. According to a few fan boards and Wikipedia, guitarists Stuart Adamson and Bruce Watson achieved the effect with the MXR Pitch Transposer 129 Guitar Effect and the e-bow, which is something of an electronic guitar pick. Anyway, if you're wondering which three tracks from this record I've chosen for this Flashback, you can read and hear more after the jump. 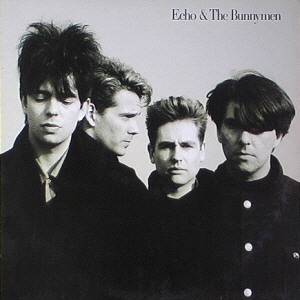 [Hits Like Sugar] -- Echo & the Bunnymen's eponymous 1987 record turned 30 this week. Over the last three decades, many albums have come into my life. Some have all but vanished from my memory shortly after their last turn in my listening rotation. Others have stayed with me, impacted me, whether I last heard one of their tracks years or mere moments ago. Echo & the Bunnymen lands squarely in the latter category. Read and hear more after the jump. 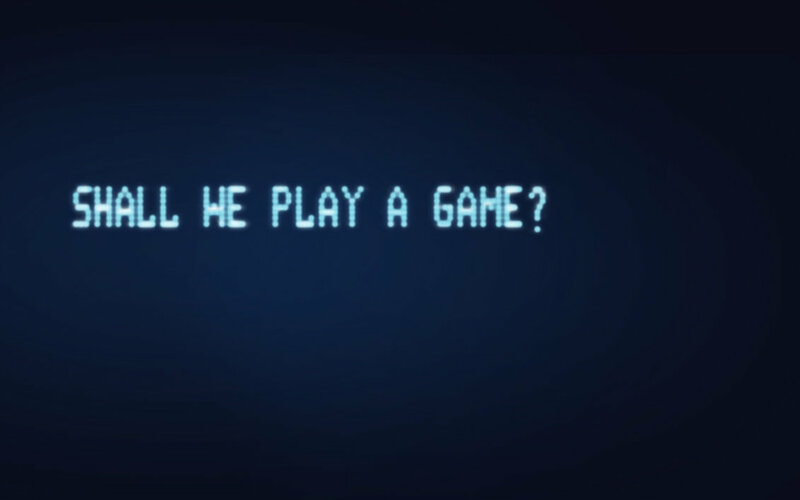 [A.I. in the 80s] -- This Flashback was originally posted to Prophet or Madman on June 29, 2012. The 60s and 70s saw computers intrude more and more in business and manufacturing. In fact, the floppy disk and microprocessor, both invented in the 70s, helped to usher in an age of practical computing. But it was the 80s that saw the home computer industry take off. As computers expanded their territory from labs and offices to homes and schools, they also started to occupy more mental real estate as well. In 1983, Time magazine chose the computer as its "Machine of the Year" for 1982 (bumping their long-standing tradition of naming a "Man of the Year"). 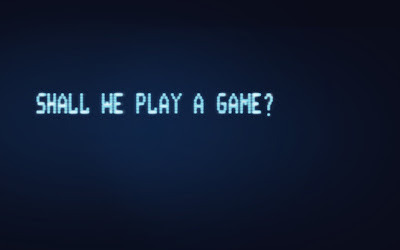 And computers provided the plot devices for several movies, usually in morality tales of technology gone amok (or greedy humans misusing innocent devices). 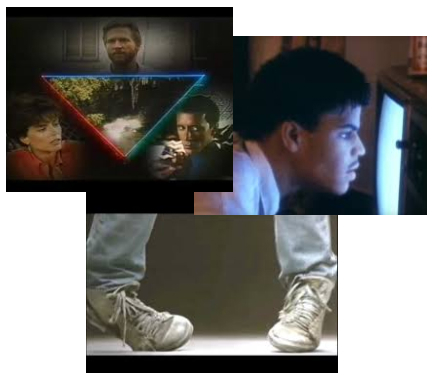 This week in the Flashback, we will look at three tunes, each one from an 80s film featuring a computer -- or at least a sub-system -- that is intelligent and can make decisions on its own. What songs did I decide upon? Read and hear more after the break. [Space Themes are Easy] -- Earlier this week, an uneasy earthgirl reminded me of the fantastically fun 80s movie, Earth Girls are Easy (1988). The plot of the movie is derived from a song of the same name, which appears on Julie Brown's EP, Goddess in Progress (1984). How Julie Brown and her writing parters -- Charlie Coffey and Terrence E. McNally -- spun nearly two hours of story from a song that is under four minutes is beyond me. But I'm so glad they did. 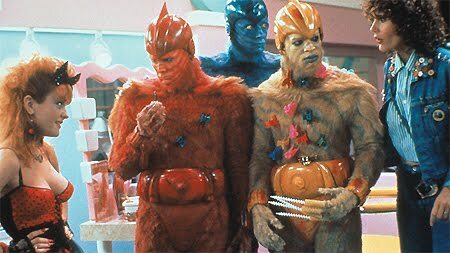 Can you imagine a world in which we never saw Jeff Goldblum, Damon Wayans, and Jim Carrey as furry aliens? As most films in the 80s, the movie included plenty of great 80s tunes. That's the good news. Unfortunately, also like many 80s flicks, much of that music does not wind up on the released soundtrack, and what is there is slightly different from the movie versions. Still, it's a pretty fun album and it's kind of perfect for a Flashback post. With 17 songs appearing in the film, and 11 tracks available on the soundtrack, which selections do you think I'll feature? Well, you'll find out when you read and hear more after the jump (which is right after the embedded movie trailer). [You're a Strange Animal] -- I seem to recall "A Criminal Mind" being a big radio hit in the US. Though my research today tells me otherwise. The song was certainly instrumental in scoring Lawrence Gowan, recording and performing under his surname, a slew of award nominations and top ten hits in his native Canada. But it doesn't seem to have even charted in the US. 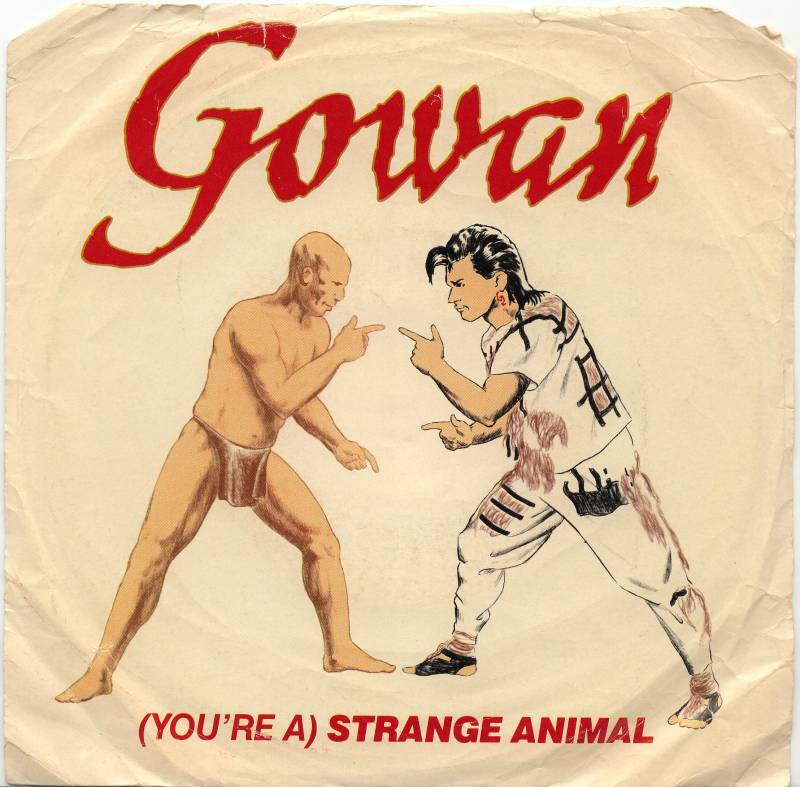 Anyway, "A Criminal Mind" was the second single off Gowan's second studio album, Strange Animal (1985). 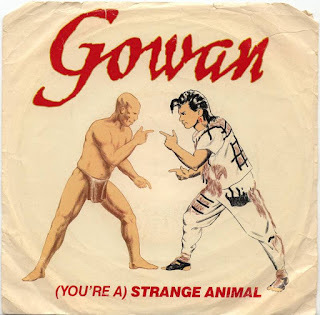 That record was also Gowan's first album release in the US. As I type this post, I don't remember how I ended up first hearing "A Criminal Mind," and digging, in the Spring of 1985. It's possible I caught the song's music video on some late night music program, but that's not my recollection. I do have a distinct memory of being awestruck over the confessional lyrics and stark instrumentation of "A Criminal Mind" as it wafted over my transistor radio. And it wasn't until the fall of 1986, at Penn State, that I heard the rest of the album. One of my dormmates was loudly playing his cassette copy of Strange Animal, and I followed my ear until I found the source. He was psyched to know of another Gowan fan, which I immediately became after hearing more of the man's songs. So, this weekend, we'll explore several of my favorite tracks from this record. If you'd like to know them, read and hear more after the jump. A few days before International Women's Day in March, a friend posted a link to an amazing book called Rebel Girls - Good Night Stories. As soon as I saw it, I thought of all the young girls in my life I wanted to gift with a copy of this book. Luckily on March 8th, International Women's Day, Rebel Girls offered a special package deal, and I ordered seven books for seven special girls. As I awaited the books' arrival, I started to think about what my message would be to each young girl who would be receiving their own book. Within a week my shipment of books arrived. They are beautiful. Rebel Girls has one of those velvety soft covers that I love. I wish I had ordered one for myself. Dangrdafne and I had a ... wonderful ... weekend. We started by attending the opening of our local farmer's market. After that, we headed to New Wave Comics & Collectibles to participate in their Wonder Woman Day celebration. 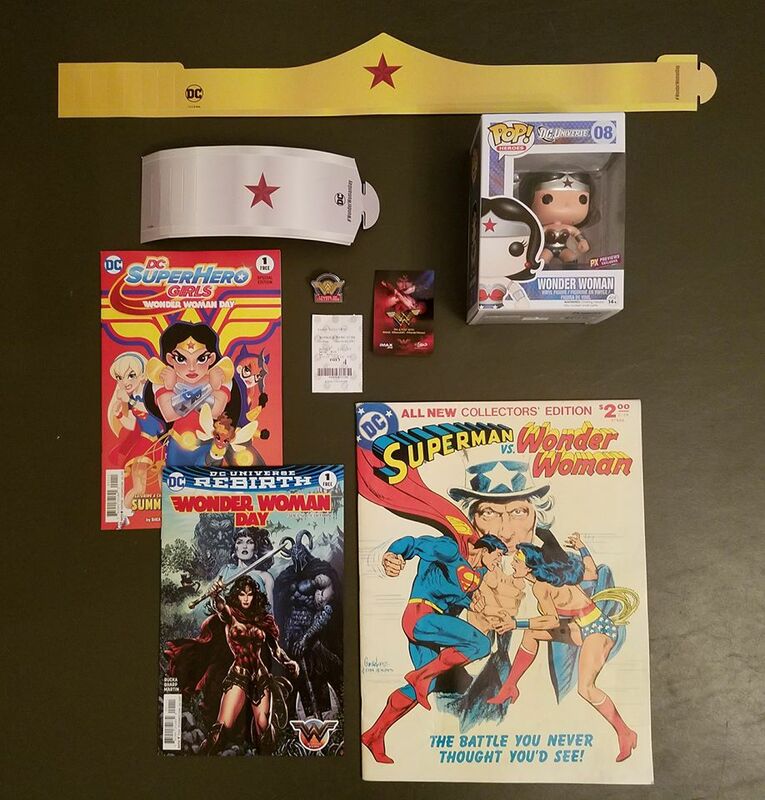 I wore a pin from the Legion of Collector's Wonder Woman box, and Dangrdafne wore her Wonder Woman wrist band. The April 2017 FanMail box theme was "The Gang's All Here"
I had forgotten about the hidden charm until FanMail did a post about the bath bomb. I immediately got the bath bomb out but since we don't have a bathtub to actually use the bath bomb, a bucket we have would have to do. I filled it up, headed outside and dropped in the bath bomb. My favorite thing about bath bombs?? ... they dissolve really really fast!! I didn't have to wait long to see the hidden charm!! 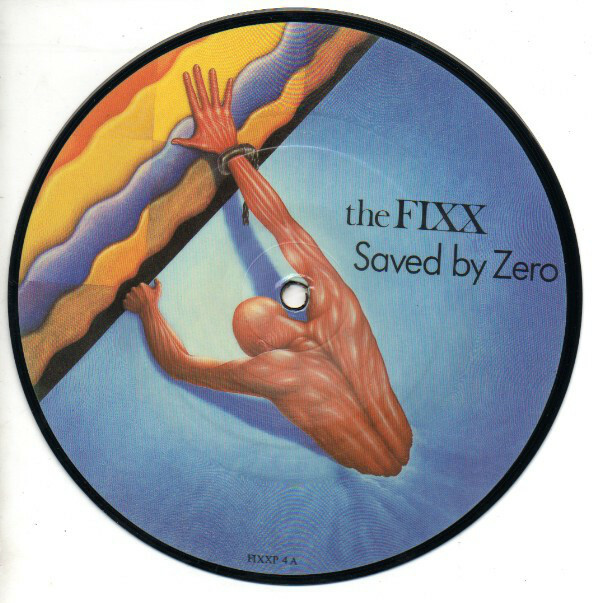 [Saved by Zero] -- In 1983, one thing led to another and I was treated to the new wavers known as The Fixx when their second studio album, Reach the Beach, came into my possession. OK, technically, it was the first single off that album that introduced me to the band, and I heard it on the radio before I owned it, but I did quickly pickup the LP so I could hear more. I'm not certain how I had missed their debut album -- probably something to do with the deficiency of radio in a small, isolated town. Anyway, this record has ringing guitar hooks and "cool, robotic slices of synth pop"[AllMusic.com review]. It's quite a time capsule of early to mid-80s melding of pop music and technology. To this day, it remains one of my favorite records. To find out why, and to see if you agree with me, read and hear more after the jump. [A-weema-weh] -- This evening, Montgomery Theater Too's production of DISNEY'S THE LION KING, JR. opens for a two-weekend run. 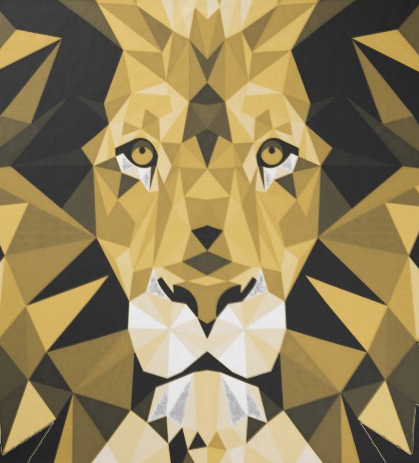 Although Disney's animated film, The Lion King, was originally released in 1994, I think I can find a few 80s songs to share in honor of the local stage production. And I won't even have to tap the work of 70s and 80s icon, Elton John, who co-wrote songs for The Lion King's soundtrack. Still, each song in this week's playlist will have at best a rather tenuous connection to the subject matter. That should be fun, right? [Word to the Mothers - Redux] -- I am re-running a previous Mother's Day Flashback post. This weekend we in the U.S. observe Mother's Day. 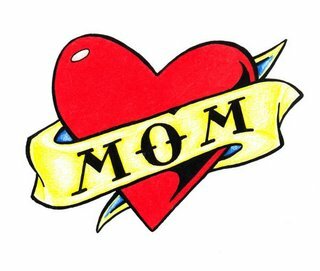 I don't know if you've ever looked for "mother" songs before, but there are many, many songs with some variation of "mother" in the title or lyrics (mother, mama, mom, etc.). However, the subject matter of the vast majority of those tunes, particularly in the 80s, was not exactly fodder for Hallmark. And, on top of that challenge, two songs that I thought were perfect for the holiday were not recorded or released in the 80s. They both came out in 1991. So, I've been scrambling to fill out this week's playlist. I think I have successfully crafted a flashback set that honors mothers, recognizes folks who have less-than-perfect relationships with their mothers, and gives a nod to something that most mothers believe about their offspring at one time or another. So don't just sit there and wonder what three songs I have for you this week. Read and hear more after the break! [Wrascally Wrabit] -- In the 80s, long before the days of the interwebz and streaming music on demand, there were only a few ways to discover new (or nearly new) music. First, of course, you had your friends. Then you had radio shows. Next, there were record stores, if you were lucky enough to have a local shop. After that, you had to rely on magazine and newsletters, which were printed on real paper. Kind of limiting, right? Well, there was one more option for the adventurous seeker. And by "adventurous," I mean, "doesn't mind possibly wasting some money." That option, my friends, was the cut-out bin. To find out more about this practice, and to check out some Wrabit tracks, you can read and hear more after the jump. [Guilty Pleasures 2 (or is it 3?)] -- Well, it's my birthday weekend. Somehow, this past week, the topic of guilty pleasures in regards to music came up. You know, songs you like even though you feel a little embarrassed about it. I first posted a few such Guilty Pleasures in 2013. I did another set in 2014, but not under the banner of "Guilty Pleasures" (that was All Right, Already, Enough with the Flamingos!) Generally speaking, if I like a song from the 80s, I'm not embarrassed about it. But that doesn't mean other folks share my opinion. So, I've decided to share a few more of my unpopular opinions. If you're curious to know three more songs that rank on my list of guilty pleasures, you can read and hear more after the break. [RIP J. Geils] -- J. Geils, guitarist and leader of the J. Geils band, passed away this week. 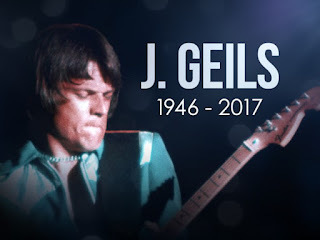 I have so many fond memories of the J. Geils Band's music that I had to make them the subject of this week's Flashback post. 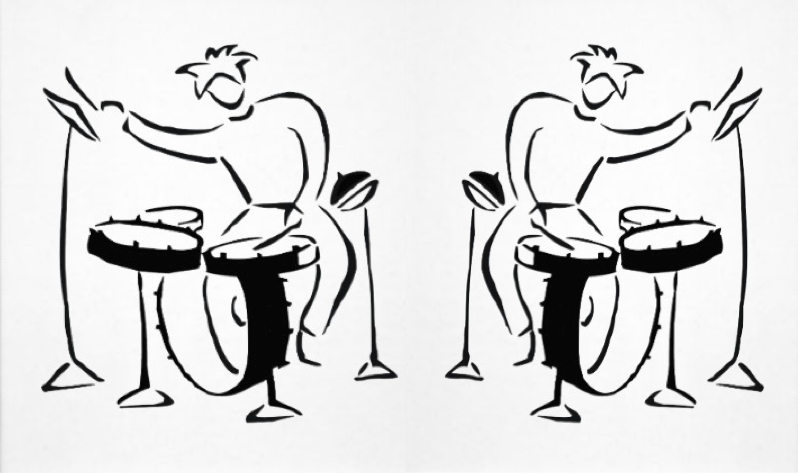 The band had its roots in the mid-60s as an acoustic blues trio called Snoopy and the Sopwith Camels. By 1968, they had opted for a more electric sound, added a few members, and rebranded themselves as the J. Geils Blues Band. They dropped the "Blues" part of the name by the time they recorded their eponymous debut album in 1970. Their third album, Bloodshot (1973), was their first taste of commercial success. But it wasn't until 1980 that they reached their peak level of success and mainstream popularity. That was shouldered squarely by two records: Love Stinks (1980) and Freeze-Frame (1981). Everyone knows the big hits from those records ("Love Stinks," "Centerfold," and "Freeze-Frame"). So the rest of this Flashback will feature a few of their lesser known tunes. I might be the only person to hold them in as high esteem as their hits, but perhaps you'll come to embrace them as I do. They're waiting for you just after the jump. Feel free to let me know your favorites as well. Yeah, Batman is still here. Respect! 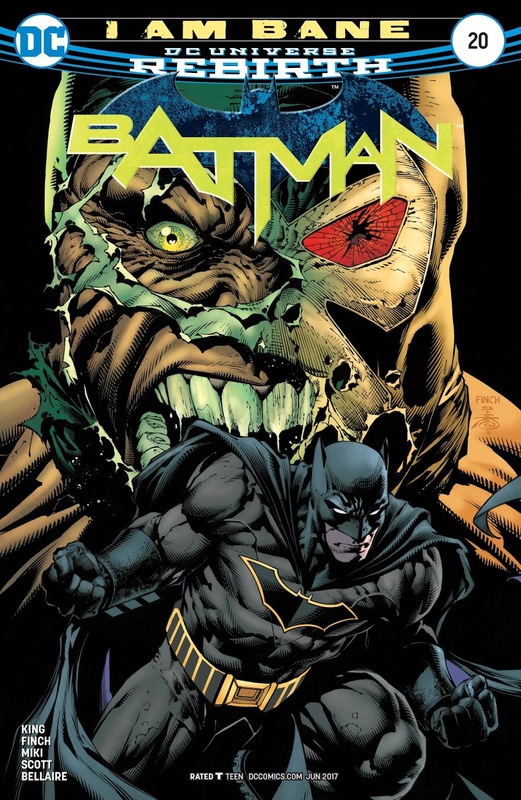 The finale of "I am Bane," the fourth arc of writer Tom King's run on Batman, comes to a close in Batman, Vol. 3 #20. Tom King (Omega Men, The Vision, The Sheriff of Babylon) might not have been everyone's pick to follow Scott Snyder, but I know I was psyched about it (I mean, I love, love LOVED his run on Omega Men). And now, after having lit a proverbial fuse about 10 issues ago, this story has paid off in spades. Or batarangs. OK, maybe not batarangs. I don't think a single batarang was thrown in this throwdown between Bane and Batman. 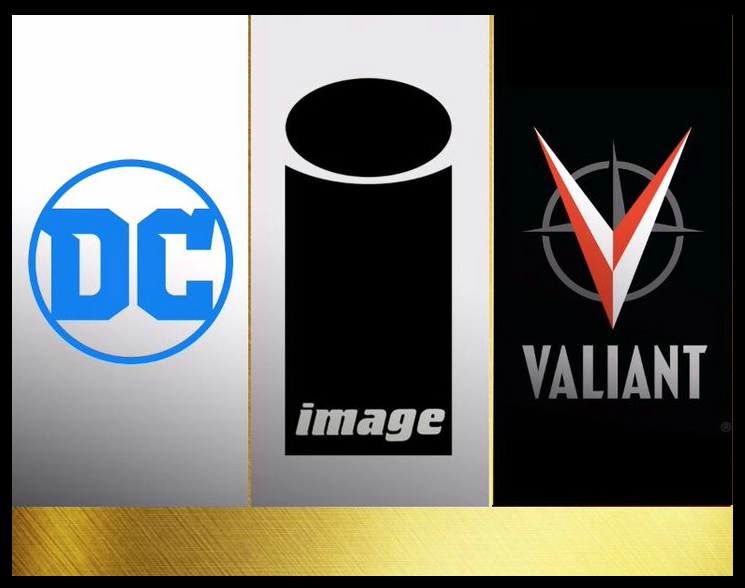 Anyway, if I'm being honest, I'm worried any time Bane is front and center. 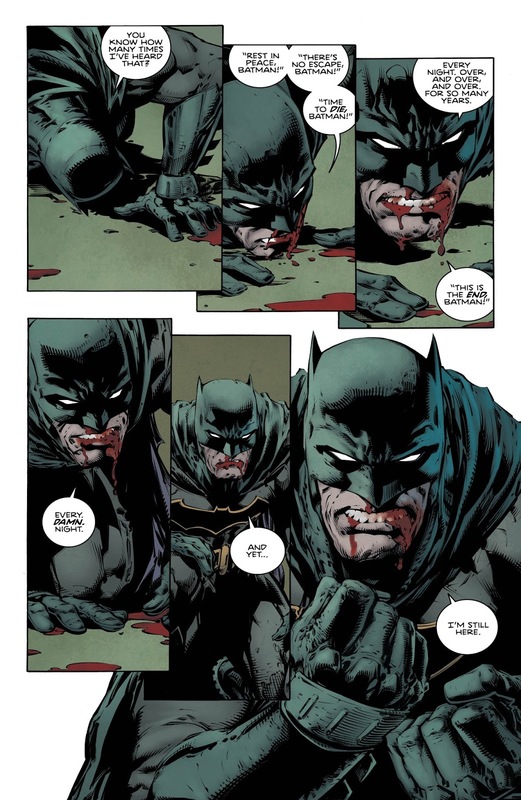 Not because I'm worried about what will happen to Batman. No, it's because I'm one of maybe a dozen Bat-fans out there who don't really care for this villain who looks, acts, and talks like a professional wrestling trope on steroids. Was that redundant? Maybe. But in the hands of King and the art team, Bane has been almost interesting. And I've been on the edge of my seat with each issue. 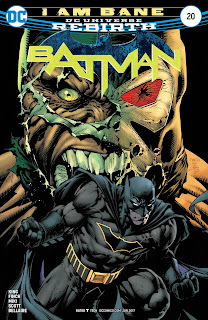 So, if you don't care about following a full story and just want a great fight where Batman shows his major gravitas, pick up this single issue. But, if you're interested in a carefully crafted yarn that shows the heart and soul of Batman, read through this entire run from the beginning of Batman Rebirth. Bobbie: "You can't weaponize cuteness." [April 7, 1984] -- Do you remember what you were doing this week in 1984? I know I was still in high school, but I have no specifics. I do, however, recall the tunes in this week's Flashback. Today we're revisiting the three tracks that topped the Billboard Hot 100 on April 7, 1984. We have two soundtrack songs, one of which is a ballad, and a song about paranoia. Man, and wait till you see how prescient that song turned out. Anyway, I'm getting ahead of myself. So, while I take a moment to sort myself, you click the jump so you can read and hear more after the break. [April Fools'] -- April 1. The 32nd of March. April Fools' (or All Fools) Day. Yes, we have come to that annual observance of mirth and (hopefully minimally destructive and non-lethal) mayhem. You know: The day of reckoning (or, day of pranks and hoaxes). Well, rather than prank you, dear 80s-philes, I shall take pity on you and merely deliver an appropriately "foolish" set of 80s tunes. With an entire decade of artists who often looked the part of fools in addition to acting the role, I have many options. 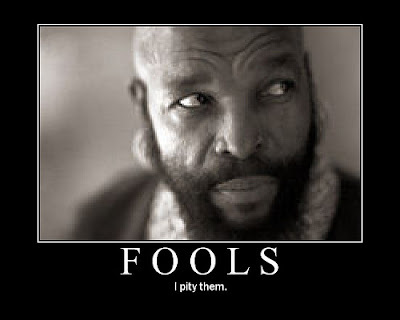 However, rather than looking to the Pucks and jesters who ruled (or attempted to rule) the charts, I chose to narrow my focus to their songs, specifically songs with some form of "fool" in the title. What foolishly delightful selections do I have for you this week? Read and hear more after the jump. [Human's Lib is 33!] -- Howard Jones' debut album, Human's Lib (1984), was the first compact disc I ever purchased. In fact, I purchased it before I even owned a CD player. You see, I was saving up for the player, and I just wanted to ensure that I had something on hand when I finally connected it to my stereo system. Anyway, Human's Lib was released in the UK on March 17, 1984, and entered the UK Album Charts in the #1 spot. It hit the US in June of that same year. Human's Lib spent a total of 57 weeks on the UK charts and has been certified 2× Platinum. It also went Gold in many European countries and the US. All four singles from this album reached the UK top 20, the first two of which even reached the US top 50. None of that is surprising as this album is so full of 80s pop goodness that just about every track could be considered a true gem. But ... I can choose only three to share with you this week. So which tunes made the cut this week? Read and hear more after the jump.